In the North of Europe, people with birch-pollen allergy can develop a strawberry allergy due to the similarity between an allergen in birch-pollen and a strawberry allergen. This is called the birch-fruit syndrome with symptoms generally appearing within 5-15 min after consuming raw plum and comprising local reactions in the mouth and throat with itching and inflammation (called oral allergy syndrome, OAS). The allergen involved in this kind of allergy does not survive cooking. Therefore, people who react to this allergen can tolerate processed strawberry. Individuals might develop adverse reactions to other fruits including apple, pear, apricot, cherry, melon, banana, nuts such as hazelnut, or vegetables such as celery tubes and carrot. This type of allergy is different to the reaction that people (especially children) may get if they eat a large quantity of the fruit which is technically an intolerance rather than an allergy. Karlsson et al. (2004)  reported the symptoms of 8 patients as follows: rhinitis (7/8), asthma (6/8) and eczema (5/8). One patient also reported stomach pain, flatulence and diarrhoea. Rodriguez et al. (2000)  reported a single patient with severe anaphylaxis after ingestion of strawberry. Wadee et al. (1990)  reported a single patient with rhinitis and pharyngeal itching after eating strawberries (or several other fruits). The most severe symptoms actually occurred with cling peaches. Karlsson et al. (2004)  used commercial extracts. Rodriguez et al. (2000)  used commercial almond extracts and fresh fruits (apricot, plum, strawberry, apple, peach, and pear). Karlsson et al. (2004)  used histamine as the positive control. Rodriguez et al. (2000)  defined a positive skin prick test result if the mean (average of orthogonal to largest diameter) wheal was 3 mm or greater (after subtracting the diameter of the wheal induced by the diluent control). Negative and positive controls for skin testing were saline solution and histamine dihydrochloride (10 mg/mL), respectively. Tests with fresh fruits were performed by the prick-prick technique. Karlsson et al. (2004)  report SPT results with strawberry for a single patient. Rodriguez et al. (2000)  tested 31 patients with strawberry extract. Karlsson et al. (2004)  reported comparative scoring for strawberry, histamine control and birch was +++(+), +++ and ++, respectively. Rodriguez et al. (2000)  reported that 13/31 patients had a positive SPT to strawberry (this was fewer than for peach, plum, pear, apple, almond or apricot). Frozen strawberries were thawed for 10 min. and homogenized. Cellular debris was removed by centrifugation. The concentration of protein was approximately 0.5 mg/ml extract. A protein enriched extract was made from strawberries frozen in liquid nitrogen and ground into a fine powder using mortar and pestle. 200 mg was extracted for 15 min at 4°C with 500 µl Tris/HCl pH 6.8, 0.7 M sucrose, 50 mM EDTA, 0.1 M KCl, 0.33g polypyrolidone and protease inhibitor cocktail (Complete TMMini, Roche). 500 µl phenol was added and the sample was thoroughly mixed by vortexing. After centrifugation at 15000 x g for 5 min., the phenol phase (upper phase) was collected. The proteins in the upper phase were precipitated by adding 5 vol of 0.1M ammonium acetate in methanol at -20°C. The precipitate was washed by repeated resuspension in 0.1M ammonium acetate in methanol at -20°C (X 2) and and acetone at -20°C (X 2). The protein precipitate was resolved in buffer and centrifuged at 15000 x g for 20 min. The yield of protein was approximately 200 µg per 200 mg frozen strawberry powder. Birch pollen, apple and timothy grass pollen were commercial extracts (Karlsson et al. 2004) . Rodriguez et al. (2000)  used commercial extracts. Karlsson et al. (2004)  tested sera from 8 patients. Rodriguez et al. (2000)  tested sera from 34 patients. Karlsson et al. (2004)  report that 4 patients were class 0, 1 patient class 1 and 3 patients were class 2 for specific IgE to strawberry. 1 patient was class 0, 1 patient was class 2 and 6 were class 4 for specific IgE to birch pollen. 2 patient were class 0, 1 patient was class 1 and 4 were class 2 and 1 was class 3 for specific IgE to apple. 4 patients were class 0, and 4 patients were class 3 for specific IgE to timothy grass pollen. Rodriguez et al. (2000)  report that sera from 14/34 patients were positive by CAP System FEIA. Karlsson et al. (2004)  separated strawberry extract (approximately 150 µg protein) by SDS-PAGE (NuPAGE 4-12% BisTris, Invitrogen). Wadee et al. (1990)  used a 5-20% acrylamide gradient separating gel with a 4% stacking gel. Karlsson et al. (2004)  transferred proteins to a polyvinylidene difluoride (PVDF) membrane and detected IgE binding with the Western Breeze Chromogenic Western Blot Immunodetection kit (Invitrogen), using as primary antibody 50 µl of patient's serum diluted to 500 µl, and as secondary antibody 500 µl of a reagent containing alkaline phosphatase-labelled murine monoclonal anti-human IgE antibody. Wadee et al. (1990)  electrophoretically transferred proteins onto a nitrocellulose sheet in a BioRad transblotting cell (60V for 3h). The membranes were quenched with 3% w/v gelatine in 2 mM Tris and 100 mM glycine and washed in Tris buffered saline with Tween 20. Strips were then incubated with 1:100 v/v dilution of patient's sera for 2 h. Membranes were washed twice in Tris buffered saline with Tween 20 and incubated with a 1:1000 v/v dilution of goat antihuman IgE horseradish peroxidase conjugate. Colour was developed with the horseradish peroxidase substrate (Bio-Rad). Karlsson et al. (2004)  report that sera from 5/8 patients showed IgE binding to a double band at 18 and 20 kDa, which were identified by mass spectroscopy as strawberry Bet v 1 homologues. One sera also identified a 50 kDa IgE binding band as well as the doublet using the protein enriched extract. Binding to strawberry proteins could be completely inhibited by addition of recombinant Bet v 1 or apple Mal d 1 but not by an extract timothy pollen or by BSA. Wadee et al. (1990)  report that IgE from the patient's sera bound a 30 kDa protein from strawberry, banana, guava, mandarin and peach. Food used and oral provocation vehicle:Rodriguez et al. (2000)  used 17 g of dehydrated whole fruit was masked in a mix of orange (200 mL) and pineapple (200 mL) juices, sugar (16 g), wheat meal (13 g), and liquid coloring (McCormick). Subjects were challenged first randomly with either food or placebo, and the interval before the second part of the DBPCFC was at least 24 hours. Yes after initial open challenge. Number of Patients:Rodriguez et al. (2000)  tested 2 patients with strawberry by DBPCFC. One patient was excluded from challenge as a severe anaphylaxis (marked laryngeal edema, significant wheezing, or hypotension) had followed immediately on consumption of strawberries within the previous year. Others were excluded by prior negative open challenges (35 positive and 147 negative over all the foods). Dose response:No dose response reported. Symptoms:No positive response was observed in either patient. The immunoblotting results above show cross-reactivity between Bet v 1 and a homologue in strawberry. Bet v 1 fully inhibits IgE binding to the strawberry homologue but strawberry does not fully inhibit binding of IgE to Bet v 1 (Karlsson et al. 2004) . Birch pollen is likely to be the primary sensitising agent. Mal d 1 also inhibits IgE binding and allergens from other Rosaceae fruits such as cherry Pru av 1 are also likely to cross-react. Karamloo et al. (2001)  found that strawberry extract could inhibit binding of IgE from pear allergic patients to Pyr c 5 by 50%, suggesting that a strawberry phenylcoumaran benzylic ether reductase is a potential croos-reactive allergen. Rodriguez et al. (2000)  note that 13/22 patients were pollen allergic. Since birch pollen allergy is less common to Bet v 1 in Spain than Northern Europe, it is possible that Bet v 1 independent IgE cross-reactivity of strawberry with peach exists as seen between peach and apple. 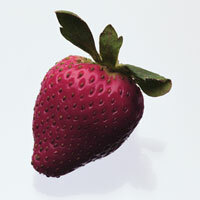 Kim and Hussain (1999)  report that 1/137 latex allergic patients was allergic to strawberry. Wadee et al. (1990)  describes a patient with serum IgE showing cross-reactivity between cling peaches, strawberries, mandarins, guavas and bananas as demonstrated by pre-adsorbsion and ELISA. Karlsson et al. (2004)  report that both strawberry protein extract and Bet v 1 cause basophil degranulation in patient's sera, suggesting that the allergens are clinically relevant. Karlsson AL, Alm R, Ekstrand B, Fjelkner-Modig S, Schiott A, Bengtsson U, Bjork L, Hjerno K, Roepstorff P, Emanuelsson CS. Bet v 1 homologues in strawberry identified as IgE-binding proteins and presumptive allergens. Prevalence of food allergy in 137 latex-allergic patients. Taylor AE, Lever L, Lawrence CM. Allergic contact dermatitis from strawberry lipsalve. Weltfriend S, Kwangsukstith C, Maibach HI. Contact urticaria from cucumber pickle and strawberry. Wadee AA, Boting LA, Rabson AR. Fruit allergy: demonstration of IgE antibodies to a 30 kd protein present in several fruits. Process, chemical, enzymatic:Not known but many Bet v 1 homologues are easily digested and lose allergenicity on cooking. It is believed that Bet v 1 acts as sensitiser for this family of proteins and that many cross-react with Bet v 1. Bet v 1 fully inhibits IgE binding to the strawberry homologue but strawberry does not fully inhibit binding of IgE to Bet v 1 (Karlsson et al. 2004) . Birch pollen is likely to be the primary sensitising agent. Mal d 1 also inhibits IgE binding and allergens from other Rosaceae fruits such cherry Pru av 1 are also likely to cross-react. Allergen properties & biological function:Proteins of the Bet v 1 family form the PR 10 family of pathogenesis-related proteins. The close homologue Mal d 1 is stress- and pathogen-inducible (Puehringer et al. 2000 ). Bet v 1 homologues have no clear biochemical function but have recently been found to bind steroids (Markovic-Housley et al. 2003 ). The tryptic peptide AFVLDADNLIPK was identied by tandem MS-MS as a sequence from the 18 kDa band and matches Mal d 1 (Karlsson et al. 2004) . The tryptic peptide GDVEIKEEHVK was found in the 20 kDa band and matches both Mal d 1 and AY679601. Other matching peptides predicted from the sequence of Mal d 1 were identified in both 18 kDa and 20 kDa bands. However, a beta-expansin peptide was also found in the 20 kDa band. The DNA sequence AY679601 translates as the C-terminal region of a Bet v 1 homologue. It is approximately 70% identical with several Mal d 1 sequences.